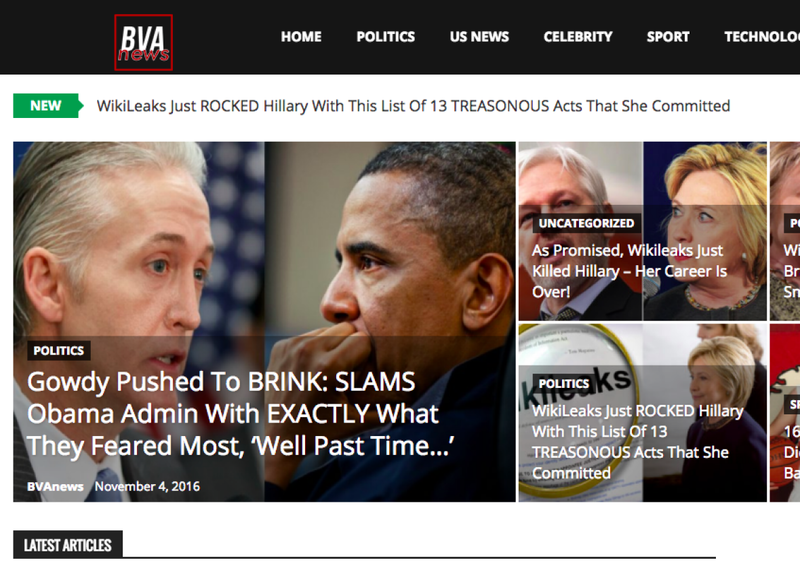 The homepage of BVAnews.com, a political propaganda site reportedly built by a Macedonian teenager. Over the past year, the Macedonian town of Veles (population 45,000) has experienced a digital gold rush as locals launched at least 140 U.S. politics websites. These sites have American-sounding domain names such as WorldPoliticus.com, TrumpVision365.com, USConservativeToday.com, DonaldTrumpNews.co, and USADailyPolitics.com. They almost all publish aggressively pro-Trump content aimed at conservatives and Trump supporters in the U.S. These sites plagiarize or aggregate stories, both real and fake, from right-wing U.S. sites, then slap provocative headlines on them and post them to Facebook. Some of the most popular stories, Silverman reports, include false claims that the pope endorsed Trump, that Gov. Mike Pence called Michelle Obama “the most vulgar first lady we’ve ever had,” and that Hillary Clinton will be indicted for her use of a private email server. These stories garnered far more engagement on Facebook than legitimate investigative stories from the likes of the New York Times. These Macedonian clickbaiters aren’t doing this because they support Trump, Silverman says. Rather, they’re doing it for profit. A 16-year-old who runs a site called BVAnews.com told him it’s averaging 1 million page views per month. He declined to share revenue figures, but in theory that could translate to tens of thousands of U.S. dollars per year—many times more than Macedonia’s median income. The 16-year-old told Silverman he experimented with pro–Bernie Sanders news during the primary, but found pro-Trump content far more popular on the social network. Speaking of giving credit where it’s due, it’s worth noting that BuzzFeed is not the first to report on the peculiar phenomenon of pro-Trump sites in Macedonia. The Guardian published a similar story in August. And the first reporting I could find on the Macedonia connection to pro-Trump news came from Renee Nal via the now-defunct Examiner.com, who at the time wondered if it could be evidence of foreign interference in the election. That doesn’t seem to be the case based on subsequent reports, including Silverman’s reporting, although the Guardian did talk to one Macedonian politics site owner who said his personal goal was to influence U.S. policy. In a way, however, the story is more interesting if you view it as a simple market response to the incentives Facebook’s news feed creates. Facebook appears to have made a genuine effort in recent years to prioritize what it calls “quality content,” as opposed to spam, scams, or misleading clickbait. Yet here we are, in the home stretch of a momentous election in which truthful reporting should be at a premium, and Facebook is overrun with viral dross that’s misleading voters, fueling partisan rage, and—according to an analysis of the data on hyperpartisan news sites by BuzzFeed in October—benefiting one candidate far more than the other. Who needs foreign interference when you have Facebook? We take misinformation on Facebook very seriously. We value authentic communication, and hear consistently from those who use Facebook that they prefer not to see misinformation. In News Feed we use various signals based on community feedback to determine which posts are likely to contain inaccurate information, and reduce their distribution. In Trending we look at a variety of signals to help make sure the topics being shown are reflective of real-world events, and take additional steps to prevent false or misleading content from appearing.